There seems to be some confusion these days about right and wrong. I’m not talking about wearing white after labor day or wearing last year’s shoes. I mean discerning between things that are plain old bad and things that are not bad. Since I work from home, I’m online all day and I see a lot of social media posts. Sometimes, I am horrified. There are some really mean, unempathetic people out there who see no problem with violence, bullying or abuse. People who literally blame the victims or minimize the attacks. Sadly, this is not uncommon. In some of the forums I visit, this attitude is taking over. (And non-suprisingly, in one forum, my ex narcopath and his flying monkeys are the ones feeding this growing sentiment and hatred for victims. One sociopath can truly infiltrate and destroy a group.) I consistently see angry posts about “victim mentality,” “perpetual victims,” and “making kids into wimps.” Shouldn’t we as civilized people be MORE angry about abusers, repeat abusers, and making kids into bullies? I have read over and over that we should teach kids to stop being victims and just hit back at the bully. While it is true that we have to protect ourselves because there are jerks in the world and we can’t control them, I believe we should still call those jerks for what they are rather than negatively focusing on what the victim should do. And “victim?” It is not a dirty word. 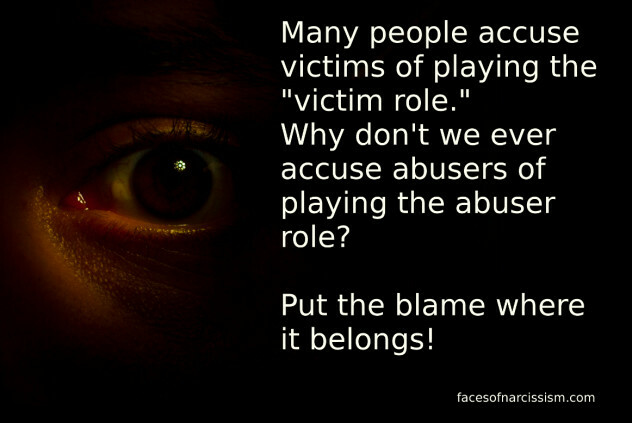 A person is a victim when they have been victimized. It’s a word. It’s a way to explain who is who in the roles of wrong and right. 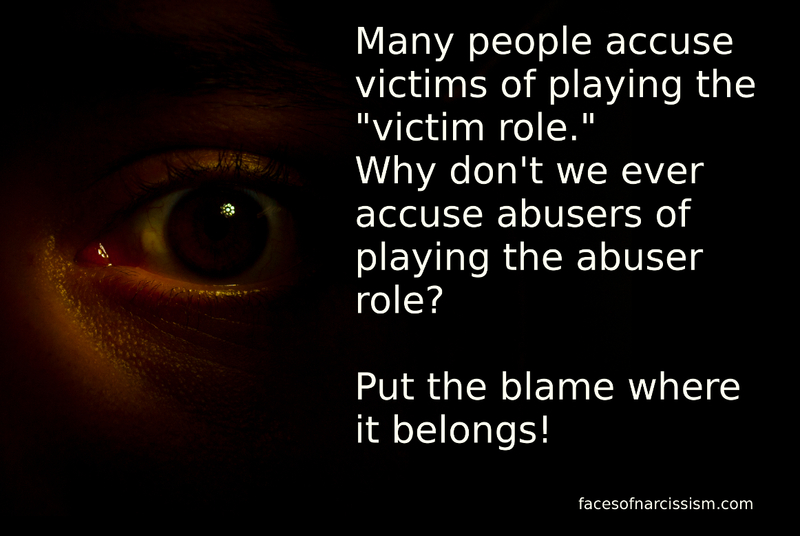 All too many people say “victim” with an air of spite and disgust, as if it’s shameful. All too many people will aim their anger at the victim and never the person who victimized them. It’s ALL on the victim to get over it. It’s all their fault for allowing it to happen. It’s all their fault for not stopping it. The people who do this never point the finger at the abuser. Today in the news, I have read multiple stories of celebrity violence, battery, abuse and otherwise bad behavior. In one story, a man pushed his wife into a window leaving her with swelling and bruising. What comments did I read? Now, I’m sure some people do lie, but I don’t believe most do. This woman was left with marks and the man was arrested. That alone says something happened. And no matter what was going on, shoving her into a window is WRONG. There should be no ifs, ands, or buts. No excuses. Don’t get mad and shove people around. Then in the news, I read about a rapper who had contacted an underage girl allegedly to recruit her for his record label. The girl and her parents thought that was inappropriate, especially since the rapper had previously dated underage girls. What comments did I read? Now maybe the rapper really was just doing business. But why aim immediate anger at the female involved? She is a child! Why hatred for the person in the more vulnerable position? This is a knee jerk reaction that I find disturbing. Especially with celebrities when their fans automatically jump to believe they are innocent. And the Bill Cosby case…oooh that’s a nasty one. I firmly believe he is a psychopath. And yet, despite dozens of women telling the same story for decades, most people are unwilling to accept that maybe they don’t truly know anything real about the funny guy they only know from television. The comments on this case are hideous. Even if we do not yet know the true level of guilt in these cases, it’s interesting and sickening that so many people immediately jump to hating and destroying the alleged victim–the weaker person. And even when it is clear that someone has been victimized, too many people hate the victim but not the abuser. Thank you..thank you…this is a mean ..uncaring world we live in..Thank God for people like you speaking out about the insanity in our society..wish you the best ..and again Thank You. I think that there are also a lot of misogynists out there who don’t like it that women are gaining equality. They think women should be put in their place. Hence the comments about the women in the piece. There are still people who treat women as chattel, and women happy to go along with that. We (UK) are only a generation away from the time when Police wouldn’t intervene in a ‘domestic’ because those attitudes were so prevalent, and there are men who would prefer that time to be back. At the same time, if anyone ever dares blog about domestic violence and not point out that men can be abused too, you’ll get some bloke crying ‘sexism’, even though women victims are the overwhelming majority.